The used vehicle market in Canada is quite limited when searching for good condition vehicles. Used vehicles in Canada generally have high mileage, mechanical problems, rust, and worn interiors. Many private sellers are dishonest, misleading, and simply attempting to rid themselves of their junk. What's more, is that many sellers believe their vehicle commands a premium price for a sub-par vehicle; The cost to quality relationship is almost outrageous. New cars are also becoming lower quality in recent years, and can be seen as "throw away" units when mileage gets higher. "They don't make them like they used to" has never rang more true. We have the belief that, if your hard earned money is being spent on a vehicle, it should price reflect in quality, longevity and enjoyment. Generally speaking, Japanese cars are very well looked after and maintained, as the 'Sha-ken' inspections require vehicles to be in top working order to be legal on the road. This means no leaks, good brakes and all safety systems are in good condition. Japan kept a lot of high-spec vehicles in their home market, mainly during the 1990's and early 2000's. Most North American market vehicles never received the high horsepower, top trim models that were common-place in Japan. Also, regular, everyday vehicles have some very neat options and extras. This is one of the main reasons JDM vehicles are so popular. Japan has one of the most efficient and sophisticated public-transit systems in the world. Most people that actually own cars don't drive nearly the amount that we do. It is not uncommon to see 15-25 year old vehicles with less than 5,000 kms per year driven. In some cases, a vehicle may have been driven only for a few years and then stored up until the owner decides to sell the vehicle. Vehicles at auction can be had at very reasonable prices. A good amount of vehicles are dealer trade-ins from people buying newer vehicles. Most dealers almost immediately send the cars to auction to be sold, rather than keeping them on the car lot, as space is a premium in Japan. All our vehicles are purchased at the many Auction houses in Japan, unless a dealer purchase is requested. Prices are very competitive with buying local pre-owned vehicles, since auction sales are to the highest bidder, not a set price. Some higher end cars have a reserve, but it is not uncommon to see discounts of 30-60% below market value, even with a reserve price. For most makes and models, there are literally hundreds to choose from every month. We strive to provide as detailed and accurate description of the vehicles as possible, before and after the auction sale. The auction sheets are, in most cases, accurate and truthful. Some give more information than others and this depends on the auction house. Any problems noted in the remarks are relayed on to the buyer, and no available information is withheld for any reason. Post-Auction, the vehicle is gone over and all defects are pointed out in high quality pictures to give the buyer as accurate a representation of their purchase as possible. Unfortunately It is becoming quite common for Japanese based dealers, as well as Canadian JDM Import re-sellers to fail to produce auction sheets for the vehicles that they sell, or blatantly lie about the true condition of the vehicle. We have many stories of people buying supposedly "mint" vehicles from dealers in the Vancouver area for a premium price, only to have their turbo or radiator fail on the drive home, have check engine lights come on, or some other problem that the dealer should (did) have knowledge about. At the buyers request, we have access to a full service shop to go over the vehicle pre/post DOT inspection to point out any mechanical issues you may run into after the vehicle lands in Canada. This is offered free of charge. If you decide to bid on a vehicle that has little information given on the auction sheet, or is an R, ***, or is obviously a very poor grade vehicle, we cannot be responsible for it's true condition, or actual mileage. These types of sales are at the buyers risk and the buyer takes on full responsibility of it's condition. Obviously, we don't recommend these types of vehicles. We also do not deal with wrecked/non-driving vehicles. It is possible to have needed mechanical repairs done in Japan at the buyers request. Labour and parts cost in Japan is a fraction of what it would cost after landed in Canada. The auction houses use a grading system to rate the quality of the vehicles they inspect. The grades range from 0-5 and also include special grades for vehicles that have been in accidents or are highly modified. These grades will be listed on the top right corner of most auctions sheets. Grade R vehicles should be judged on a car by car basis, as they may be accident repair vehicles or a highly modified car with a good deal of engine and suspension work or major aero-upgrades and full re-spray. 5: Very good condition and requires no repairs. No body parts have been changed. Essentially "As-New". 4.5: Has some minor or slight blemishes. It would become a grade 5 with slight repair. Might have a few slight scratches or dents. 4: Very good overall condition, but there are a few scratches or dents, repair marks, or blemishes. 3.5: Has some conspicuous scratches or dents. Might have repaired slight damage to a bumper. 3: Has many conspicuous scratches, dents, or some paint damage or fading. 2: Is in very bad condition. Rust, Interior in bad shape, corrosion holes, oil leaks, etc. RA: A car which has had minor accident damage and has been repaired. We do not purchase these vehicles unless requested to. R: A car which has had accident damage, (minor to major) and been repaired. We do not purchase these vehicles unless requested to. *** A car which has had accident damage, and has NOT been repaired yet. Or a car with an engine that does not work with major engine trouble. This rating can also refer to "written off" vehicles. We do not deal in severely damaged or wrecked cars. These vehicles usually have very little, to no information given as it would take an inspector a long time to list every problem with the vehicle on the sheet. These are generally "as-is" type vehicles. Beside the overall grade is the interior score; A, B, C, D.
(A) Being very good to as-new condition, and (D) being quite poor or a gutted interior. 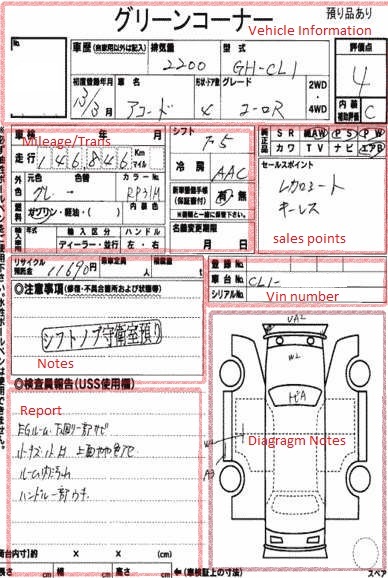 Each auction sheet will have a vehicle diagram (typically at the lower right corner) with a section for each panel of the vehicle. The major houses use a letter and number combination to note any damages to the vehicle. The higher the number next to the letter, the worse the damage is. For example, an A3 is a major scratch while an A1 is a minor scratch.